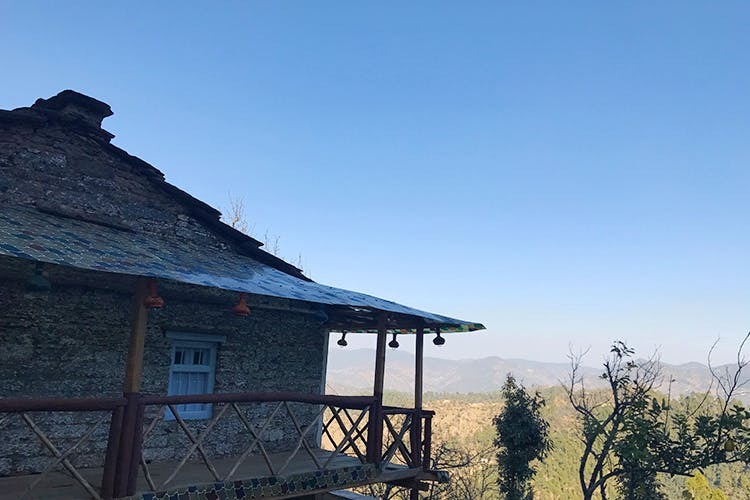 Situated in Almora, approximately 45 kms from Nainital and 80 kms from Kathgodam, Sukoon Homestay does justice to its name and envelopes you in peace and tranquility. From the moment you spot this traditional Kumaoni house set in the wilderness, you’re bound to fall in love with it. The scenic views of the Nanda Devi Peaks will welcome you every morning as you sip your tea on the balcony, and the crystal night sky will make you want to spend hours gazing up at the innumerable stars. The place is managed by a dedicated on-site caretaker (who goes out of his way to help you) and the food is served fresh and organic. In a nutshell—beautiful, bonfire evenings, lazy naps in hammocks, the starriest night sky you’ll ever see, minimal human interaction and immense solitude—all of this awaits you here. Reaching the location is a bit tricky—we suggest keeping in touch with the host so he can help you out with that. This place is not for those who prize comfort—there are no ACs or fans (with such pleasant weather, you won't really need it, though) and some rooms do not have an attached washroom. So, you'll have to confirm those things before you make your bookings. Also, you may not find any packaged food available here. So, carry your own drinks and snacks.